MOVE ALONG THE BUS PLEASE! As a software company, Bubble Bus has been active for a couple of years, regularly turning up at computer shows with their distinctive red stand modelled on a double-decker bus. Most of their games have been for the Commodore 64 and Vic20 but they have been broadening out their range recently with games for the MSX machines, the Einstein and Amstrad either ready or on the way. Their first game for the Spectrum was HUSTLER, a pool simulation which came out just before Christmas. But now they’ve got a CRASH Smash on their hands, in the form of WIZARD’S LAIR, which was written by STEVEN CROW, a 19 year old freelance programmer. CRASH person GRAEME KIDD talked to Steven at the recent LET show at Olympia. 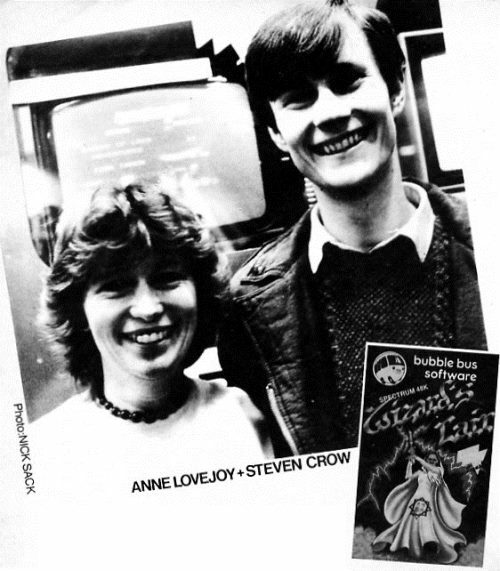 It would have been much more pleasant to have interviewed Steven on Bubble Bus’ home ground — they’re based in a converted granary in Tunbridge, Kent, which is quite an idyllic setting — ‘duck mind your head’ signs on the beams and a river meandering at the bottom of the garden. As it was, the tight-fisted Editor of this organ, having failed to coerce poor old Lloyd Mangram into cycling from his cottage to the Bubble Bus HQ, thrust a tape recorder into my hand at the LET show and sent me off to find Steven. When you come to write a game how do you go about it — do you sit down with a graphical idea? S Yes, I sort of draw out a few screen shots of what I want the game to look like and then after that I think of all the features I want to put in it. Before I start I make sure I have everything sorted out so that I know it’ll fit in the memory. When you’re writing 45K of code it’s got to fit in. I allocate for each section of the game how much I’m going to give so that map might have 7K — I’ll allocate 7K for the map and 20K for graphics — that’s how I do it. G So it’s not just structured programming, it’s structured games design? S Yes, the actual program isn’t so structured but the idea is. I wouldn’t start a game and only have half an idea of what I’m going to do. You don’t know how it’s going to turn out then and it’s a bit of a risk. G How do you design your graphics? S I write my own routines that do graphics and I just sketch them on the screen. I either have a joystick connected or use cursor keys, I draw everything onto the screen first — if I want to draw a tree I just fiddle about on the screen until I’ve got a tree that I’m happy with. G Have you had any art training? S Yes, I got an ‘O’ Level in one year, and was doing the ‘A’ Level but had to give it up. I liked art, that was probably my best subject at school. G So that the actual shape drawing isn’t too much of a problem? S No, no, I don’t have any problem really — if I don’t like something I’ll get rid of it and try and draw it again. G In Wizard’s Lair the graphics are particularly outstanding. S Yes, it took me a long time to do some of those things! The long case clock probably look the longest — that really took me a long time to get right — and also the little bloke so it looks as if you’re looking down on him. Making his head look bigger than his feet as if you’re looking down on him, that took quite a lot of time — I must have done about ten drawings before I was satisfied. G What sort of plans do you have at the moment, are you working on another project? S Yes, I am writing another game — a 500 screen arcade/adventure — hopefully I’m going to put it on the Spectrum and MSX and on the Amstrad as well — I want to broaden out on to other machines — because when you’ve spent a long time writing a game and getting everything right, converting it to run on to another machine is not too much hard work and of course you get more sales that way. Steve has always worked as a freelance, starting in the days when he worked for the now defunct Poppysoft and never worked as part of a team of programmers writing a game. He admits to being a bit of a loner, and gets a lot of satisfaction from starting a game and completing it himself. G What about the gloom and despondency which is being preached in parts of the software industry? How does it affect you as a freelance?